Stroke and Brain Injury - brain injury caused by ischemic stroke is potentially reversible and my research work has been developing approaches to detect reversible brain tissues more accurately and precisely. Telestroke in China - patients in rural areas or in developing countries often have no access to best-evidence healthcare. One of my aims is to provide evidence-based acute stroke care to patients in rural regions of China, using advanced brain imaging and telemedicine. When I was a medical student, I learnt the importance of good clinical practice based on evidence. The evidence comes from good researches. My drive of being a researcher is to produce scientific evidences to continually support good clinical practice. In the near future, I believe research from my group will help to form a telestroke network in Australia and in China. My work, which focuses on telestroke network in China, will help to change policies in China to cover telestroke consultation cost for all patients in hospitals of rural areas. My research on advanced brain imaging will help to shape a standardised framework to implement advanced brain imaging in stroke, not only within Australia. It will contribute to changes in national and international stroke management guidelines by adding advanced brain imaging as a clinical practice routine for acute stroke patients. Dr Longting Lin is currently doing post-doctoral research work with the University of Newcastle Priority Research Centre for Stroke and Traumatic Brain Injury and HMRI. Her research focus has been on the implementation of advanced brain imaging in acute stroke management, where she has gained extensive experience in brain imaging interpretation, data analysis and operating imaging software and statistical software. Results of her doctoral and post-doctoral research work have been published in leading international journals in the field. Her work has also been presented in Australian and international stroke conferences, awarded as the best presentation in the Asian and Pacific Stroke Conference 2014, which proves her skill in delivering public speech. For the past year, Dr Lin has gained research leadership experience as the management and international coordination of INSPIRE (INternational Stroke Perfusion Imaging Registry), an internationally web-based stroke database involving multiple hospitals in Australia, China, Canada, and India. She has also led the Asian roll-out of one of Australia’s flagship acute stroke trials TASTE (Tenecteplase versus Alteplase Stroke Therapy Evaluation). This leadership provides Dr Lin the knowledge and experience in working with clinicians and health service management both in Australia and Asia. Dr Lin’s capability and standing in her field was recently evidenced by her leading the Hunter Medical University/John Hunter Hospital/University of Newcastle delegation supporting the NSW Minister of Health in exporting new collaboration for health research in China. Dr Lin graduated from Harbin Medical University, China, and before she moved to Australia she was trained as a neurologist in the First Affiliated Hospital of the Harbin Medical University. Her clinical background not only provided her the knowledge of stroke and stroke patients, but also gives her a translational perspective of thinking about research. 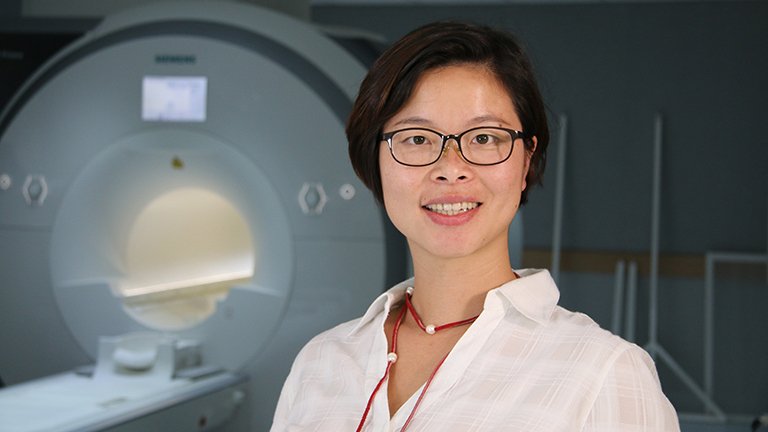 So far, her PhD research findings validating advanced brain imaging in patient selection for acute stroke therapies have been implemented in John Hunter Hospital and also across many hospitals both in Australia and China. Her work in advanced brain imaging “decision assistance” for stroke therapy implementation positions her very strongly in major areas of both therapeutic and economic importance given the unmet need and the major burden of acute stroke globally. Building on the established and growing advanced imaging supported telestroke service established in the Hunter Region, Dr Longting Lin is developing a program that uses HMRI/John Hunter Hospital as training hubs for advanced imaging in acute stroke care and build a network of research collaboration in China. This research program will support and enhance a new and potentially highly productive international collaboration in stroke care between Australia and China.